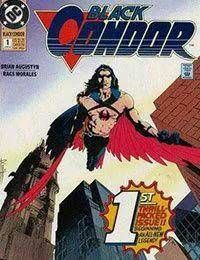 This 12-issue series features the debut of the second Black Condor. This character, created by series creatorsRags Morales and Brian Augustyn, was a serious departure from the Golden Age Black Condor. This new Black Condor, Ryan Kendall, had no desire to be a superhero, and was content to protect his area of the world: the New Jersey pinelands. This series featured guest appearances from the Ray and Batman. During this series, the Black Condor would also serve a short stint in the Justice League. After the series ended, Augustyn would tell one last Black Condor story in Showcase 94. The story of Black Condor would wrap up in the pages of The Ray.